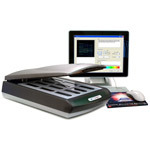 Arrayit SpotBot® Extreme Protein Edition Microarray Spotters are the finest protein microarrayers on the market, with an instrument capacity of one 384-well source microplate, 16 microarray printing pins and 28 glass substrate slides (25 x 76 mm). SpotBot® Extreme extends the legacy of the industry-leading SpotBot® instruments, with 356 installations worldwide since being introduced in 2001. 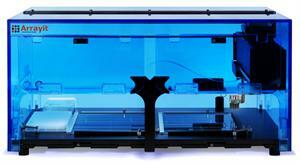 SBXPRO is equipped with platen cooling down to 4°C, megasonic pin cleaning, wash and dry station, magnetic door sensors, high-performance professional series printhead, intuitive graphical user interface, a heavy duty gantry, and advanced robotics to ensure accuracy, ease-of-operation and affordability in protein microarray printing. SpotBot® Extreme Protein Edition prints 10,000 samples onto 28 substrates in 12 hours using 16 Arrayit patented 946 Micro Spotting Pins. 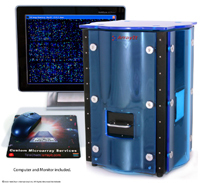 SpotBot® Extreme PRO is the perfect protein microarrayer for research laboratories and core facilities seeking greater speed and throughput while maintaining compactness, portability and affordability. SpotBot® Extreme Protein Edition has compact physical height x depth x width dimensions of 27 x 30 x 54 cm (10 x 12 x 21") and weighs only 11.4 kg (24 lb). SBX PRO systems include chiller bath, 3 liters of liquid coolant, 16 microarray printing pins (946MP4), 1 test pin, 4 anti-vibration instrument pads, professional series 16-position printhead, 2 L-bracket substrate slide locators, Protein Printing Buffer (PPB), SuperEpoxy 3 Microarray Substrate Slides, humidity control, peristaltic pump, air compressor, wash buffer reservoir, wash waste reservoir, Arrayit BioBlue Mini Computer, LED flat panel display, keyboard, mouse, mouse pad, and Ethernet cable.